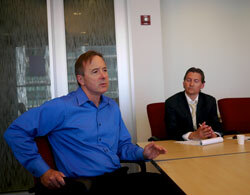 CTA President Forrest Claypool and CTA spokesman Brian Steele. Photo by Steven Vance. The need to repair the transit agency’s financial situation was one of the common themes in CTA President Forrest Claypool’s interview with local bloggers earlier this week. In referencing both plans to rebuild the North Side Red & Purple Lines and extend the Red Line further south to 130th, Claypool highlighted the need for a new federal transportation bill. For the North Side Red & Purple Line modernization, Claypool said that the CTA intends to apply for federal “new starts” funding for the project. Currently, such funds can’t be used to overhaul existing infrastructure, but Claypool hopes that the new transportation bill will change that. “The Senate version of the transportation bill, which is in concurrence now with the House, allows for core expansion, which means that if it’s a new railroad that just happens to be within an existing right of way, that’s considered a new start,” Claypool said, adding that he’s cautiously optimistic that the Senate version of the bill will pass. In identifying some of the other challenges facing the CTA, Claypool discussed the need to balance the agency’s operational budget and negotiate a new labor agreement. Claypool says that the current labor cost structure is simply “out of whack” with modern economic realities. He’s hoping that a new labor agreement will be in place by the end of the year. Claypool also discussed a recent request for proposals issued by the CTA that’s asking for private companies to provide “bus garage operations management” for the agency’s 74th Street bus garage. He described the proposal as a possible way to improve performance and inject competition amongst bus garages. But Claypool stressed that no decisions have been made on whether or not to follow through on the plan. Despite the ongoing struggle to reduce operational costs, Claypool says he sees “doomsday” budget scenarios as a thing of the past.